16. (Q) How was this particular Great Pyramid of Gizeh built? (A) By the use of those forces in nature as make for iron to swim. Stone floats in the air in the same manner. This will be discovered in '58. Reading 5748-6. The Great Pyramid a remaining ancient wonder and still a wonder for the modern times. This incredible edifice has a height of a 48 story building with each side longer than 2 ½ football fields; it has a foot print of 13 acres, and is the tallest human made structure built until the late 19th century. It is estimated to have 2, 300,000 stone blocks with each block having average weight of 2 ½ tons with some blocks weighing over 70 tons. It alignment to the cardinal points of the compass is just 3 minutes of a degree off perfect and to this day after thousands upon thousands of years it is less than an inch of being perfectly level. The interior passage ways and rooms are assembled so exactly that you cannot get a credit card between the seams of the blocks. It is an unbelievable scientific engineering and architectural phenomenon that’s construction is still a mystery today. Many theories have been put forth on how it was constructed; first by slaves, now by a city of free Egyptian artisan and engineers, perhaps with linear ramps, or with spiral ramps, perhaps with block and tackles, or with kites to lift stones, theories even include the assistance of extraterrestrials. How it was constructed can also be found in the Edgar Cayce readings as cited in the beginning of this article: “By the use of those forces in nature as make for iron to swim. Stone floats in the air in the same manner” (Reading 5748-6). So how do stones float in air with what similar forces to “make for iron to swim”? Objects can float in the air thanks to buoyancy, which an upward force that the air exerts on them. The objects must weigh less than the air it displaces., this is different from lift. Now, new scientific discoveries are adding credence and validation to the Cayce reading on the method of construction with the possible us sound to create this buoyancy. Below are excerpts from this scientific new research. New discoveries show that ordinary sound has a negative gravity mass. "It would be really interesting to see if these effects are measurable," said Esposito. This new discovery that ordinary sound has the potential ability to create a negative gravitational mass thus having the ability of repelling or pushing objects in the opposite direction of gravity having the effect of the objects bobbing in air like a corks in water or having “stones float in air” . This finding from the scientific community and this burgeoning discovery opens the possibility of sound being used to lift objects and further shows just how incredible the information in Cayce readings have been for so many years and continue to be today. I have written several articles about what I call the “Cayce Cubit” or “Spinal Cubit” that, according to the Cayce readings, was in use in ancient Egypt in the construction of its monuments and temples. You can find many of these articles on this website and the Edgar Cayce website. The “Cayce Cubit’s” use and elegance was not something I took at face value, I was a “doubting Thomas” and wanted to see and find the proof, the evidence of its possible use and I did time and time again. I found evidence of an ancient Egyptian cubit called a Nb, Nbi, or Nebiu by Egyptologists of 27.5 inches and discovered cultural significance for its use with multiple aspects in ancient Egypt in their construction and spiritual philosophy. 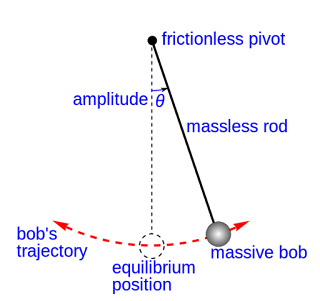 Further that this Cayce Cubit functioned ideally as a “2-second”pendulum (swung from the horizontal), the length of a “2-second” pendulum; the “2-seconf pendulum” being one of the finalist proposals for determining the original length of the meter as an international standard measure. Additionally there is significant evidence that this Cayce unit of measurement was used at other sacred sites around the globe to connect Heaven and Earth such as Chichen Itza, Mexico and Stonehenge in England. Recently as I have gone the Cayce readings again I have come across another amazing “nugget” with beautiful and elegant significance of the using and symbolism for the “Cayce Cubit”. It is a reading about the time of the high priest “Ra-Ta” in ancient Egypt, circa 10,500 BC. The readings is about the beginning of the construction of the “temple beautiful and the “temple of sacrifice” and that during this period the ancient Egyptians had other temples with the description of one used for “birthing” at the time to facilitate bring in the most perfect newborns. The reading included the dimensions of the birthing rooms. Why this reading did not catch my attention before, I do not know, but this time I thought to apply the “Cayce Cubit” to the room dimensions. After doing so I sat back and smiled in awe, again at the elegance of it all. The results give you a room that is 3 x 4 (in Cayce cubits). Perhaps the reader asks why this seems so significant and elegant. The reason being, dear reader is that if you divide this rectangular room dimension diagonally making two right triangles, the result is two right triangles that are 3 x 4 x 5. This creates the prime and perfect Pythagorean right triangle probably known better as A-squared times B-squared = C-squared!! Pythagoras, the ancient Greek philosopher that so little is known of and his “Mystery School”, it is believed he traveled to India, Persia, Phoenicia, and in particular Egypt in acquiring his knowledge and wisdom. What Pythagoras is credited for in reference to this prime Pythagorean triangle is that it is the most prefect beautiful triangle representing a triad of equilibrium, knowledge and wisdom. That it is the progenitor of polygons and symbolizes the trinity of the masculine – feminine – offspring, the spirit body and soul, the triad of Osiris – Isis – Horus. Thus this creates in the Ancient Egyptian Philosophy the perfect dimensions for a room to bring new life into the Earth. The dimensions described for exactly such rooms in ancient Egypt in the Cayce readings. The Cayce readings again and again show that these are active living readings that continually have knowledge and wisdom to share with seekers. That the readings should be reviewed on a regular basis; for when the student is ready the teacher will appear. The Maya city Ichakabal Discovered!! Over 50 years after an Edgar Cayce reading named it. The Cayce reading recommended to her that she had latent abilities and skills as a historian or “datastician” (sic) that should be developed. Her reading continued describing past lives where she was a teacher, record keeper, plan designer and interpreter of crystals and natures fires. It was suggested to develop her talents in such fashions, such as a historian in her present lifetime. The past life for her Cayce reading described in the Yucatan caught my eye. 18. Before that the entity was in the Yucatan land, when there were those activities in which there were those groups that had caused dissension among the worshipers in the temple there of Ichakabal. 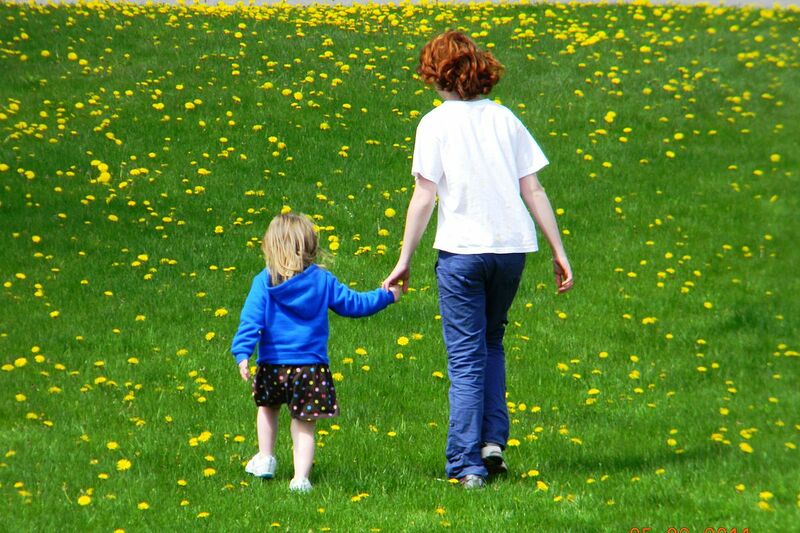 In those activities we find whole groups of individuals being separated, and seeking for activities in other groups. 19. The entity maintained that the activities there, in Ichakabal, were to be kept. These brought periods of disappointment for the entity. Eventually the entity became the priestess there, but with the groups being led away by Horcatiaus, they were periods of depression for the entity. 20. In the latter part of the experience there, even though the groups had become small, there were those activities that brought the greater spiritual unfoldment, spiritual development for the entity…. Unashamedly I am avid researcher and occasional writer based in the Cayce readings; particularly the readings involving ancient cultures, along with the common threads and links between such ancient cultures the Cayce readings commonly make reference too. In particular the cultures of the Ancient Egyptians, the Cliff Dwellers of the SW United States, the builders of Stonehenge, and the Maya. Though I have written and presented on Cayce readings in such areas sharing the validating evidence collaborated in the readings sharing how there are not only cultural links, but also spiritual links. In that vein a recent article I came across piqued my interest. Ichkabal! The name of a Maya city in the readings, could this be? Incredible! This is the first time I have come across a reading with the name of an unknown, undiscovered ancient city that is then discovered by the scientific community. The synchronicity of finding this article at this time made me smile. The Cayce readings time and time again tell how we are connected, not only with each other but with all consciousness. Through the years this truth from the readings had been proven on a regular basis. If we practice meditation, contemplative prayer and apply it in our lives such experiences happen more and more. I have had the opportunity through the years to explore multiple Maya sites and led a tour to some Maya areas. Right now I am preparing to lead another tour to Maya sites again and it was in that preparation and research Ichkabal was brought to my attention. Needless to say after finding this article, I searched for more. I then could see why I hadn’t found it before, this is a recent discovery and almost all the articles about it are in Spanish. (Thank you “Google translation”) As I read them, and there are not many, one could see, archeologically speaking, this is a recent site and funding for such research takes years. Thanks to “Google translate” the information in these links could be pursued to reveal even more about this discovery. Many of the articles are from Mexico’s INAH, their nation institute for Archeological and Historical research, which was important in validating the source information. It should be noted that the readings spell this Maya city; Ichakabal, while the archeologists spell it; Ichkabal. I would suggest since the readings were written down as Edgar Cayce spoke, and the slight difference is merely a phonetic difference only. One of the aspects that really caught my attention was how this Mayan site discovered by the archeologists was given its name. This is a stunning turn of events! This ancient Maya city was not assigned a name until 1995, fifty-two years after being cited in the reading. It seems what is being experienced here are not only Cayce’s ability to tap into the universal consciousness of experiences and events in the past, but also his prescience ability to see into the future. I already used incredible, so let me write, amazing! Remember, the National institute wrote that they named this site (Ichkabal) in 1995 “to highlight the physiographic features of the site environment.” The archeologists choose the name from its surroundings while physically visiting the site. I sit back and think about that, these archeologist climbing through the jungle to reach this site, whereas Edgar Cayce, spoke of and named this Maya city from the couch in his home office, thousands of miles in space and thousands of years in time removed from the city’s inception. His climb to the same place was through the Akashic record and through this manner named it and some of the events occurring in an ancient time. The Cayce reading tells us that even with the dissension it was a place where greater spiritual unfoldment occurred. Ongoing research at the site is reaching similar conclusions. This is not a minor discovery; the researchers describe this site as a very important Maya site with a pyramid temple that absolutely dwarfs the Kulkulcan pyramid at Chitzen itza. The Cayce readings detail that there were religious/spiritual dissentions at the time with the populace separating in to groups, many being led away from the city and leaving a smaller remaining group. This section of the reading collaborates with the archeologist’s hypothesis as they excavate and research Ichkabal, that it was not reasons of war or famine for the exodus of populations of such cities. As the Cayce reading points out; Ichkabal had an exodus of many of its dwellers over spiritual differences, but was not abandoned. The woman (Shekla) for whom the readings was given remained with others. This shows even the name given for a Maya priestess, related to pine, in the Cayce readings would be appropriate for the person’s position and the specific culture that is being described. These are not random, happenstance results. Nor do I believe that this reading’s recommendation to pursue history for this individual was happenstance. Rather that this reading was prophetic not only for her, but also for those who research the readings, for in such pursuits, it can be seen how rich and still unfolding the readings are towards spiritual evolvement, medical assistance, and clearly the ancient cultures being shared in them. Presented here is more evidence of Edgar Cayce’s ability not only to describe accurately ancient past cultures, cities, and events, but also future events, in this case the discovery and naming of this Maya city. Ichkabal is just being unearthed, there is much yet to come from the ongoing excavations of this site. My dream is to find a way to this site, it has not yet been opened to the public, and to share it with others, to be present, to explore on the ground what Edgar Cayce explored in his psychic state. There is so much more to this and the Cayce readings, but for now let’s just absorb and appreciate this further validation of the significance and value of the Cayce readings. Ultimately this shows that the tens of thousands of pages of the Edgar Cayce readings are alive, they are living breathing resources of knowledge pertaining to humanity’s purpose, spiritual journey, ancient history, physical health and our evolving consciousness. The readings are not static to be read once and filed away. In so many ways humanity, science and our individual consciousness are catching up to the rich resources awaiting our active participation and searching. As been stated by many before; when the student is ready, the teacher appears. The readings are such an active teacher, the student just needs to be ready. Mexico’s National Institute of Anthropology will open the site to visitors for the first time in late 2017 or early 2018. Faith, a small but incredibly powerful word, just five letters, yet the concept that it attempts to contain in those five letters represents an infinite power, a power that can fuel our spirit and give strength to our minds and bodies far beyond any physical substance could. We are probably all familiar with this word both hearing it and using it; I have faith in you, keep the faith baby, I took it on faith, a leap of faith, having the faith of a mustard seed. Yet, how well does anyone grasp it or experience it. As General Semantics philosophy would phrase it; the name is not the thing in itself. Faith goes far beyond its name. Like another small word; atom, describing such a small particle that it can only be seen with some of the world’s most powerful microscopes, yet, split this minute particle and immense power flows out. The power in the atom pales compares what is contained in faith. There are dictionary definitions of faith; a firm belief in something for which there is no proof. Perhaps the Bible gives one of the better definitions of faith; Now faith is the substance of things hoped for, the evidence of things not seen. (Hebrews 11.1) The Biblical definition and General Semantics coming closer to the mark realizing that the being, the concept of faith transcends physical proof and embrace the greater reality of mind and spirit. The Cayce readings state this quite well. If one wants to understand how well they understand their own grasp of faith, I would suggest bringing some friends together and discuss each understanding of one’s individual concept of faith. You will probably find a variety of perspectives on faith’s meaning. Such a discussion, though just words, helps us seen into ourselves how well our knowing of faith is. In the ability in expression to others of our concept we see how well we grasp it ourselves. Here is one of the first steps to measure how much faith is applied, practiced in our personal lives. For faith is an experience, it is living and growing, it is active, not passive, it is participating with each other and the universe acting on its power and concept. In the beginning I noted several phrases that we have probably heard and used, one I had not included was the phase; “An ACT of Faith.” That is an integral part in knowing and growing of faith within us. The application, the participation with faith, through our daily experiences helps bring it beyond a word to a knowing. A variety of the world’s sacred texts share examples of such active faith. The Bible has a wonderful example of acting and living individual faith. 9 When Jesus heard this, he was amazed at him. Turning to the crowd that was following him, he said, “I tell you, not even in Israel have I found this kind of faith!” 10 Then the men who had been sent returned to the house and found the servant in perfect health. This Roman centurion did not just sit back and wait for the Master or the universe to stroll by and aid him; He Acted! Even though he felt he was not worthy he participated and took action and in his actions he lived his great faith. This example is an important one. The centurion On occasion I have seen people, well intended, stop and say I have faith and I am just going to sit here and wait for God to show me or give me a sign for what to do next. I have been guilty of this misunderstanding of faith, in the past, myself. To stop working and acting on faith, sitting back and waiting to be guided. This is not going into the experience, the application of a living, active, act of faith. This is not participating with spirit, as the Cayce would term it; to become Co-creators with God. To put it another way, if guidance is needed; get up and go ask someone for directions or go seeking a map. Faith is not something that is passive; it is active living participation in our daily experiences and beliefs, which is how faith grows to move mountains. It is even at the core of the act of communion. The etymology of the word communion is mutual participation. If they are met in Him that is the Maker, the Creator of all that exists in manifestation, as He has promised, then not in BLIND faith is it met - but by the deeds and the thoughts and the acts of the body, that through Him the conditions may be met day by day. Thus has He bought every soul that would trust in Him. 442-3. Ideally with these words and with remembering of the knowing of faith we already have in our being we can incorporate them in to our daily living and being, acting in faith and growing in faith. In the participation our faith will develop, will expand exponentially , like the splitting of an atom we can split open the word of faith into an ever expanding transcendental experience of light for ourselves and others leading us to our ultimate destination of the Empyrean light. It provides us fuel for now and the future. I have written and presented often on the spiritual symbolism found in sacred geometry, a symbolism that is shared by spiritual philosophies through the ages and around the world. (Sacred Geometry and Spiritual Symbolism: The Blueprint for Creation) Recent exciting discoveries of 1st century C.E. 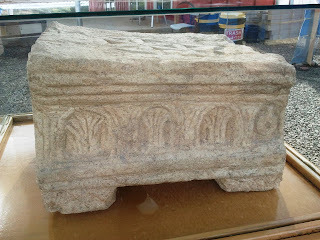 synagogue in the ancient city of Magdala, Israel have truly brought this concept full circle. The “find” at this site is remarkable and significant in further uniting this perennial philosophy. Before I share it let me reaffirm some basic tenets in reference to sacred geometry to format the context. Sacred geometry involves universal patterns used in the design of everything in our reality, most often seen in sacred architecture and sacred art. The basic belief is that geometry and mathematical ratios, harmonics and proportion are also found in music, light, and cosmology. This value system is seen as widespread even in prehistory, a cultural universal of the human condition. They may be considered Universal Archetypes. In the Hermetic tradition of; “As above so below”, reflecting each other in the Macrocosm and the microcosm. It reflects the fabric of the universe and the very fabric of ourselves. Though the Edgar Cayce readings did not use the term “sacred geometry”; they describe the similar purpose of such symbolic patterns. 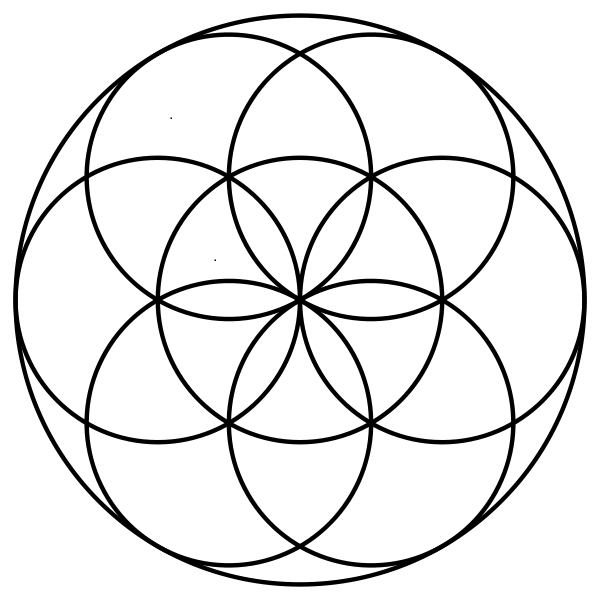 For the purpose of this article the related sacred geometry involved are the flower of life, the seed of life, the Vesica Pisces with the triangles created within it, and the six pointed star. (See below) Each of these symbols, in their fashion, represent an Axis Mundi; a representation joining together Heaven and Earth. In the case of the Vesica Pisces (two overlapping circles) it is also seen as a womb of creation where spirit and matter come together. Some may recognize this as the ICTHYS; the symbol for Jesus the Christ. This is very apt as Jesus represented both the son of man and son of God, thus bringing Heaven and Earth together. 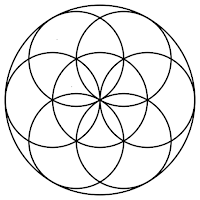 As these overlapping circles continue on and on they create more and more Vesica Pisces which are interlinked in the form of the 6-petaled lotus (seed of life). Then these “seeds “continue repeatedly into the flower of life, which then goes on ad infinitum uniting the finite within the infinite, weaving the united harmony of Heaven and Earth. 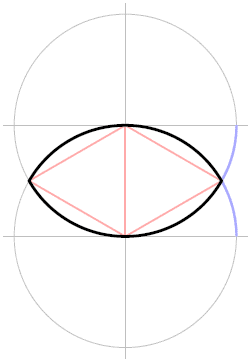 Also illustrated are the two triangles, back to back or diamond shape that is created within each Vesica Pisces petal. 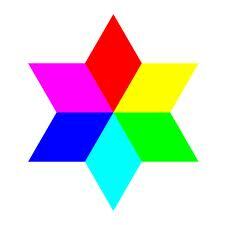 Then it can be seen by creating the triangles-diamond shape in the six-petal lotus, the six-pointed star or hexagram, also known as the Hebrew Star of David or Seal of Solomon is created. In the Western tradition this is recognized as an important symbol of Judaism. 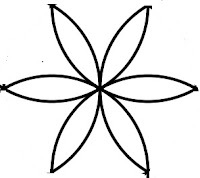 In the Eastern tradition of Hinduism this six-pointed star is known as the Shatkona and represents the Supreme Being joining with Mother Earth. The Cayce readings describe the meaning of the six-pointed star in a similar manner. Now allow me to present the amazing find in Israel; the Magdala Stone and share its amazing significance. 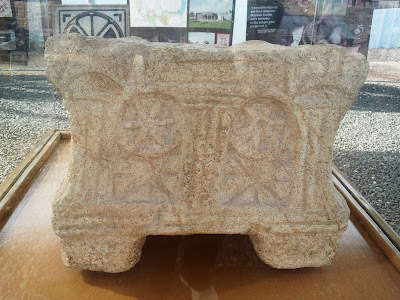 Depicted above is what is being called the Magdala table discovered during archeological excavations of a first century synagogue I referenced before in Israel. 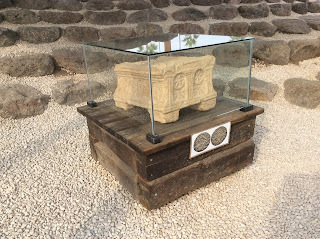 This table was found in the part of the temple that they considered would have been the “holy of holies”. Further excavations of the site unearthed a coin dated to 29 A.D. evidence of the time period of the synagogue. A time period when Mary of Magdala or Jesus the Christ could have prayed in this very place of worship! The symbols carved on this table and their interpretation I found breath taking. The following are some excerpts of the archeologist’s interpretation of this limestone table itself and what it was designed to represent. 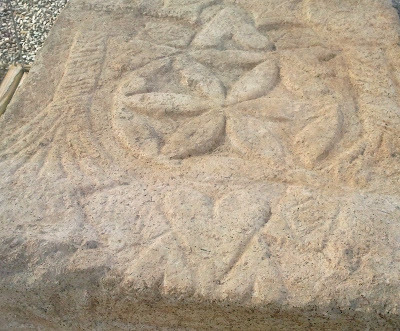 Another fascinating symbol dominates the center of the top of the Magdala Stone: a six-petaled rosette. It is flanked by columns with palmette capitals, echoing ancient Jewish historian Josephus’s description of the area directly before the Holy of Holies. The rosette itself symbolizes the actual veil before the Holy of Holies. Josephus describes this veil as being decorated with flowers—perhaps with this very rosette. What is being described here is a curtain of “Flowers of Life” in the temple that one would be passing through to enter into the “Holy of Holies” of bringing Heaven and Earth together in the present; exactly what these symbols represent around the world! Then there are the symbols on the side of the Magdala table described as wheels (author note; yet looking like “seeds of life”) and triangles. As Jesus pointed out, we ourselves are the earthly Temple and in knowing such, we can raise ourselves up to Heaven/God consciousness while still on Earth. 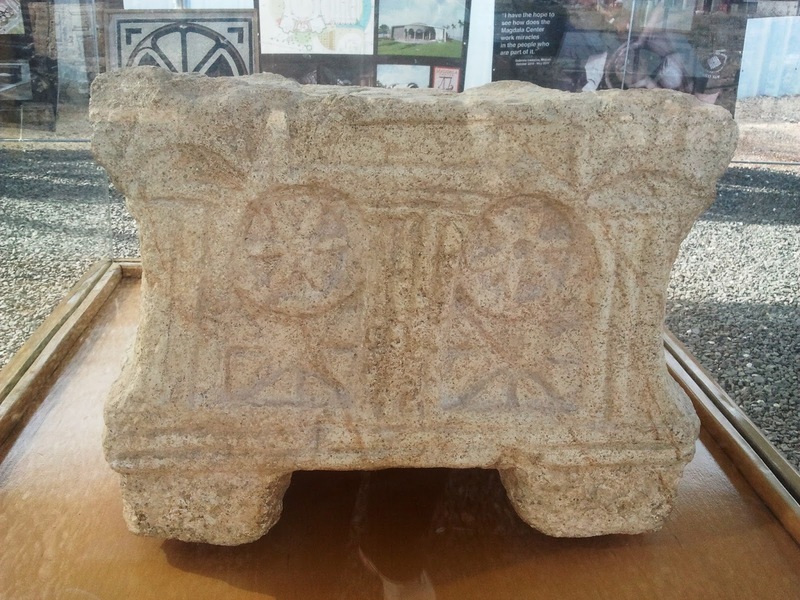 I hope you can see this Magdala table discovery and be both in awe and rejoicing at the same time as I am. In awe that this incredible significant symbolic table was present at the time of Jesus, that Jesus may have actually been present and read the Torah on it. That Jesus, his disciples, and others would have understood the deep symbolism of this table as has been described here of uniting Heaven and Earth within oneself as the purpose and goal of humanity. Then the rejoicing that this message is clearly perennial and can be found through the ages and the spiritual philosophies of all humanity, that we all share this spiritual goal and unity. In an earlier article (VI Oct – Dec ’11) I wrote about an ancient Egyptian cubit spoken of By Edgar Cayce in reading 281-25. An Egyptian cubit known of, but generally considered inconsequential by today’s mainstream Egyptologist, though written about more significantly by Dr. Livio Stecchinni , a professor of ancient measurements. I demonstrated the extraordinary and compelling evidence of the use of this cubit at three different sacred sites, on three different continents. This substantiation, at the very least, alludes that such a shared unit of measurement would have to come from an advanced culture that could travel worldwide. Obviously this is verified in numerous Cayce readings. Unfortunately such a source is considered unacceptable by mainstream archeology. If the scientific community can reach beyond the hubris that we must be the most advanced society the earth has seen and therefore the further one goes back in history the more primitive the culture must be. Perhaps that last observation is too strong, but there does appear to be a bias towards the idea of an advanced ancient civilization that could travel between continents and share its wisdom and technology, thousands, if not tens of thousand years ago. Add on top of that that the initial evidence came from psychic information as provided by Edgar Cayce and many simply stop listening at all. That is truly a shame. I understand merely stating it as fact is not enough, evidence needs to be provided but that should not preclude researchers from using psychic information as a springboard for further investigation to the possibilities. Remember the “mythical” city of Troy from Homer’s Iliad was actually found. Further until recently it was thought the construction of megalithic structures was impossible before “civilizations from 3000 B.C. That now has been overturned by the ongoing finds and excavations at Gobekli Tepe in Turkey, where multiple megalithic stone circles, similar to Stonehenge have been discovered and confidently dated to at least 9600 B.C. with evidence of more buried stone circles possibly 3000 years older! My recent research is now showing evidence that the “Cayce Cubit” could well be an even greater verification of a worldwide advanced culture, with an ancient international system of measurements, in what would be considered prehistoric times. Obviously the evidence is already there as earlier presented with this same cubit being used at these three sites, but is there any other precedent for such an international unit of measure? The answer is yes, in what could be considered a subsequent system proof; it is in our modern day metric system (I.S.). To really appreciate history repeating itself here, a brief record of the creation of the meter is needed. It started in the late 1600’s with several scientist of the time who began calling for the need of international units of measure. Their initial suggestion for this unit of measurement was to use the length of a pendulum that half of it’s to and fro swing equaled one second. The actual full period swing is 2 seconds and these pendulums are known as “2 second pendulums”. From the 1600’s to 1930 pendulum time pieces were considered the most accurate time pieces in the world. This became known as a “second’s pendulum.” The length suggested was 39 ¼ inches (997mm), this was the length of the pendulum that when swung at less than a 20 degree arc became a seconds pendulum. It would take over another one hundred years before the suggestion for an international standard would really begin to move forward. While the French revolution was going on struggling for its age of enlightenment the push for an international unit of measure began again. This time the discussion was to use the pendulum length as a unit of measure or a fraction of the length of the distance along a meridian from the Equator through Paris to the North Pole. Though the pendulum was considered a good choice in its portability and ease to re-create all over the world, think of the metronome used in keeping time for music or a grandfather clock, it uses the same principle. It was argued that due to gravitational discrepancies in different places in the Earth that the pendulum would not be accurate enough. It was finally decided to use one ten millionth of the distance from Equator to Pole, this would be the meter. A 7 year plus expedition than was commissioned to get this equator to pole measurement. The meter’s fascinating history continues down a long convoluted journey and is now evolved to be the distance light travels in a vacuum in 1/299792459 of a second. I posit that the “Cayce Cubit” of 27 ½ inches was used in a similar manner as today’s meter for an international unit of measurement in what is considered prehistoric time. Besides the structures themselves that provided standing evidence of its use in Egypt, Great Britain and Mexico, there is further evidence provided in the history of these ancient cultures and the history of the modern meter. As noted above the way to determine the length of the meter boiled down to two final choices. The choices being a tiny fraction measurement of the earth’s surface, which took another 7 years of expeditions to get a very close measurement of, or the length of a “Seconds Pendulum”. Each recommendation had its own drawbacks, but I think about which one would be the easiest to share and re-create among other varying cultures and could be passed on even if a civilization fails. I believe the answer is clear, it would be the pendulum. The next question is what about their suggested length of 39 and ¼ inches for the “seconds’ pendulum”, that still doesn’t fit! That is correct, for a pendulum that is swung at less than 20 degrees. So I researched what length should a pendulum be if swung at a different degree angle and still create a seconds pendulum. Incredibly what I discovered was that starting the swing of a pendulum at 90 degrees (at the horizontal) you will get this all-important 2 second pendulum if the length is 27.5 inches! Incredible! Fascinatingly there is more evidence for this unit provided by the Great Pyramid of Egypt. Several researchers have noted that the Great Pyramid appears to be a geodesic model of the Earth (see Wm R Fix: Pyramid Odyssey). Different Dimensions of the Great pyramid, such as its height and perimeter are a very accurate 1/43200 model of the dimensions of the Earth. The interesting point here is that the “seconds pendulum “, a pendulum with a 2 second period, is a 1/43200 portion of a mean solar day. A mean solar day equals 86,400 seconds. Please remember the ancient Egyptians are credited with giving us a 24 hour day. Using the Cayce cubit then, not only gives significant results in its units of measurement for the Great Pyramid, but as a model of the Earth and keeper of time. This is even more appropriate when examines the survey equipment that may have been used not only to build such structures, but also to measure and transit the stars above. In the case of the Egyptians this was called a “merkhet” which is translated, appropriately as an instrument of knowing or an “instrument of time keeping”. It was known to be used for time keeping by measuring stars, find North, and for building construction. 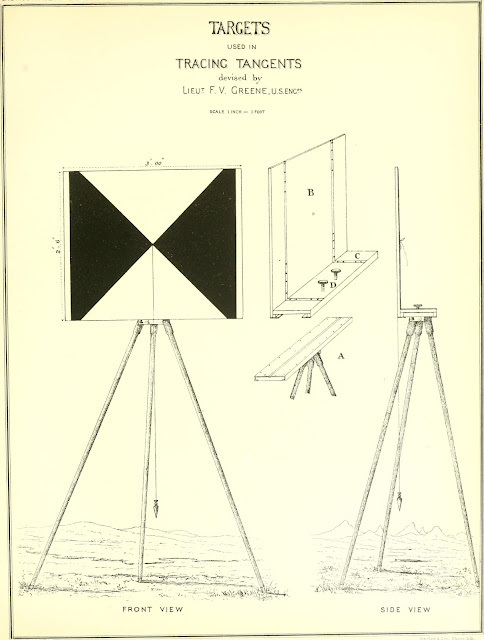 This was very similar to a surveyor’s tripod and plumb bob and as such it could have also functioned as a pendulum. The Egyptians and the Maya both had “stretching of the cord” ceremonies, used for measurement in the construction of their structures and in some case in measuring of the heavens. Both civilizations also are known for their advanced understanding and measuring of time. The builders of Stonehenge are more of an enigma, but traveling to the British Isles would by an advanced culture and sharing such knowledge would have been even simpler. So there it is, by being willing to use the information provided from the psychic readings of Edgar Cayce which included an Egyptian cubit length ignored by Egyptologists, an advanced ancient civilization that could travel the world, and that world representatives even met as a council in Egypt, one can find valid confirming evidence for international sharing of information. In using the information provided by Edgar Cayce’s psychic ability, along with archeological and scientific evidence, the theory for a type of international unit of measurement that would be simple to travel with and recreate all over the world with a pendulum or just the instructions to build a pendulum can be submitted . By using the knowledge provided, exactly what our own scientist suggested doing for an international unit of measurement, using a pendulum, works the same way for the Cayce cubit. The evidence of those sites I wrote about all appearing to use the Cayce cubit help validate the theory. It is so elegant, plausible and simple! As Troy, once considered a fictional city, became an archeological reality, so moves the psychic archeology of Edgar Cayce. A.R.E. 51st Annual Spring Palestine Retreat March 12-15, 2015 Learn to Understand the Mind of God: Bringing Together Heaven and Earth Through Christ Consciousness with Henry Reed, PhD and Don Carroll Call A.R.E. Conferences Registrar: 800-333-4499. Please take time to visit some of my favorite digital locales.